Aldrich Place is a short street in South Buffalo between South Park Avenue and McKinley Parkway near the Buffalo-Lackawanna border. The street is named after a man who was one of the first settlers in that part of South Buffalo. Alexander Aldrich came to Buffalo from England as a young man with his wife, Lucinda. In 1855, Mr. Aldrich purchased a 50-acre farm that included the land that is now Aldrich Place. His farm stretched from the present day South Park Avenue to McKinley Parkway, south to the railroad lines and north to Downing Street. His farm mainly raised celery, black walnuts and flowers. 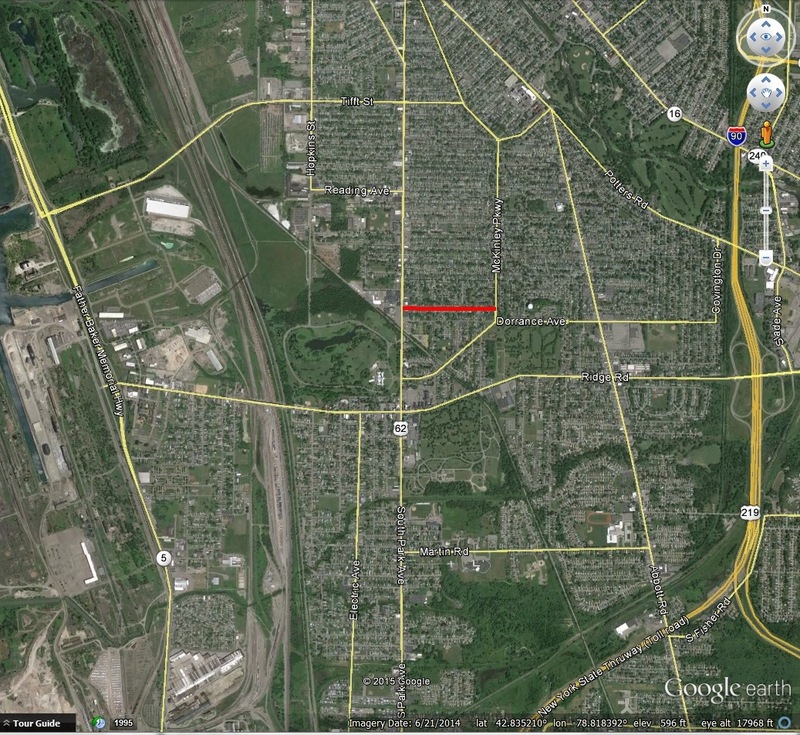 At the time, this section of South Buffalo was famous for its celery. He built a greenhouse for the flowers on the South Park Avenue side of his property, selling to people on their way to Holy Cross Cemetery. In those days, the Aldrich farm was located in a sparsely populated neighborhood. Lucinda would tell stories of days when Native Americans would peer in the window. They were curious about the light coming out of the windows and wanted to watch what a white family did at night. During the Civil War, Alexander and Lucinda traveled to Washington, DC. While there, Alexander had his photo taken with President Lincoln on the steps of the White House. If any members of the Aldrich family are reading this, I’d love to see the photo if it still exists!! Alexander and Lucinda had three sons – Henry, Wallace, and Albert – and a daughter, Sally, who became Mrs. Ace Reed. Henry was a taxidermist. Albert was in charge of most of the excavating and grading for the South Park Botanical Gardens. To do this work, ten teams of horses were used; Albert hired his neighbors to assist in the work. Mr. Aldrich later sold his farm to the Pixley Land Company for development in 1903. The Aldrich family house was moved to Downing Street and converted into apartments. 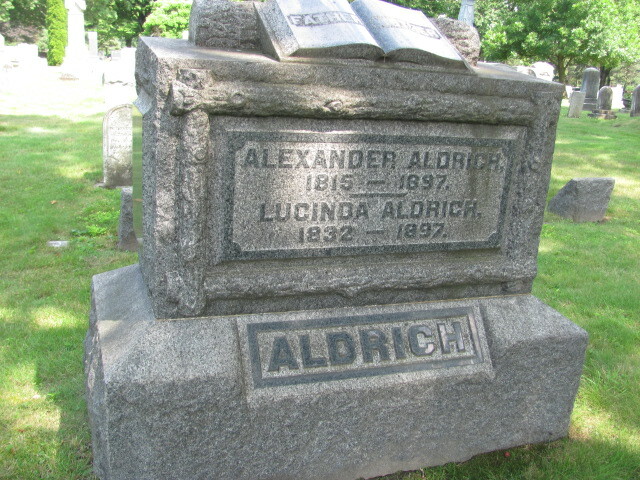 Alexander Aldrich died in 1897 and is buried in Woodlawn Cemetery in Orchard Park. Alexander’s grandson, Robert Reed, was the first mayor of Lackawanna. Check out the street index to learn about other streets! Another great post! Let me know if you ever come across any info on precinct 13 on Austin Street. I have an ancestry mystery that I can’t figure out living on the West coast. My great grand uncle was a cop there and for the life of me I can’t find out what happened when he was let go for sBit reason in 1907. He took his own life in the parking lot right after. His son, of the same name did the same in 1924 after murdering his mother in law. It’s the senior I can’t seem to gather info on. That said, his name was Louis Gielow. Or Ludwig Gielow. Wow…that’s an intense family story! I’ll see if I can dig anything up next time I’m researching! I read with great interest your story concerning Aldrich Place. I am related to Alexander Aldrich, our 1st relative in America to come from England. I have a photo of Alexander with Abraham Lincoln at the White House and would be happy to share it with you. Excellent post. I love how looking at what may seem like a mundane or tangential topic, the names of streets in this case, provides an insight into life and Buffalo at the time. Thank you. The photo does exist it hangs in my living room at the moment. Hadn’t known the whole story of the naming of the street but I had known portions. Thanks. Awesome, glad the photo is still around! Thanks for sharing! Mr. N. Aldrich, my name is Tim Aldrich and I wondering if we are related. The photo you have in your living room with Alexander Aldrich…, is it at the White House and is it with a group of people or just the president. Hope you can reply to this question, we could be related.